An international team of geoscientists has uncovered geological differences between two segments of an earthquake fault that may explain why the 2004 Sumatra Boxing Day Tsunami was so much more devastating than a second earthquake generated tsunami three months later. This could help solve what was a lingering mystery for earthquake researchers. The quakes were caused by ruptures on adjacent segments of the same fault. One key difference was that the southern part of the fault that ruptured in 2004, producing the larger quake and tsunami, appears bright on subsurface seismic images possibly explained by a lower density fault zone than the surrounding sediments. In the 2005 segment of the fault, there was no evidence for such a low-density fault zone. This and several other differences resulted in the fault slipping over a much longer segment and reaching much closer to the seafloor in the first quake. Because tsunami waves are generated by the motion of the seafloor, a quake that moves more seafloor creates larger tsunamis. Early in the morning of Dec. 26, 2004 a powerful undersea earthquake started off the west coast of Sumatra, Indonesia and extended about 1,200 kilometers (750 miles) to the north. The resulting tsunami caused devastation along the coastlines bordering the Indian Ocean, with tsunami waves up to 30 meters (100 feet) high inundating coastal communities. With very little warning of impending disaster, more than 230,000 people died and millions were made homeless. Three months later in 2005, another strong earthquake (although significantly smaller than in 2004) occurred immediately to the south, but triggered only a relatively small tsunami that claimed far fewer lives. A team of researchers from The University of Southampton in the United Kingdom, The University of Texas at Austin, The Agency for the Assessment and Application of Technology in Indonesia and The Indonesia Institute for Sciences has discovered one clue as to why the two earthquakes were so different. Working aboard the research vessel Sonne, the scientists used seismic instruments to probe layers of sediment beneath the seafloor with sound waves. They discovered a number of unusual features at the rupture zone of the 2004 earthquake such as the seabed topography, how the sediments are deformed and the locations of small earthquakes (aftershocks) following the main earthquake. They found the southern end of the 2004 rupture zone was unique in one other key way. To understand that requires a little background on how and why earthquakes happen there at all. The largest undersea earthquakes occur at subduction zones, such as the one west of Indonesia, where one tectonic plate is forced (or subducts) under another. This subduction doesn't happen smoothly however, but sticks and then slips or ruptures with the release of vast amounts of stored energy as an earthquake. 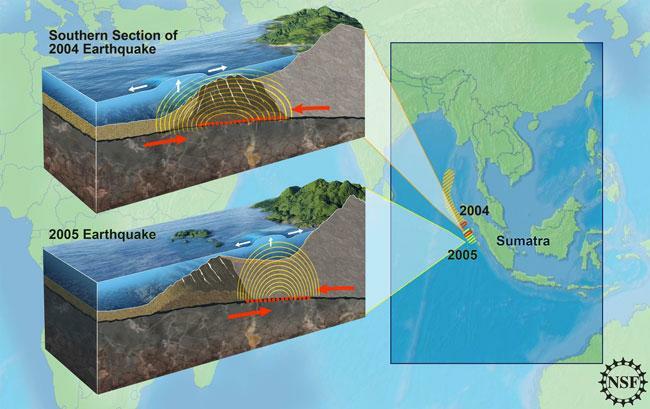 The plate boundary between the overriding Sumatran and Andaman islands and the subducting Indian Ocean sticks and slips in segments. This kind of plate boundary is called a décollement and is a very shallow fault running from beneath the trench to under the islands. The researchers found that the décollement surface has different properties in the two earthquake rupture regions. In the 2004 area, the décollement was seismically imaged from the ship as a bright reflection whose specifics suggest lower density materials that would affect friction. In the 2005 area the décollement does not show these particular characteristics and thus would behave differently in an earthquake. This and several other differences resulted in the fault slipping over a much longer segment in 2004 and reaching much closer to the seafloor, potentially causing a larger tsunami. The results of their study appear in the July 9 edition of the journal Science. The paper's lead author is Simon Dean, of the University of Southampton's School of Ocean and Earth Science, which is based at the National Oceanography Centre, Southampton (NOC). "Both earthquakes occurred on the same fault system, initiating 30-40 kilometers below the seabed," said Dean. "Our results will help us understand why different parts of the fault behave differently during earthquake slip which then influences tsunami generation. This is critical for adequate hazard assessment and mitigation." By comparing these results with other subduction zones around the world, the research team believes the region of the 2004 Sumatra earthquake is very unusual, suggesting that tsunami hazards may be particularly high in this region. "By understanding parameters that make a particular region more hazardous in terms of earthquakes and tsunami we can speak to potential hazards of other margins," said Sean Gulick, a research scientist at The University of Texas at Austin's Institute for Geophysics. "We need to examine what limits the size of earthquakes and what properties contribute to tsunami formation." The fact that the 2004 and 2005 source areas were different is good news. Had the two fault segments ruptured together, the resulting earthquake would have been about a magnitude 9.3 instead of 9.2. Because the earthquake magnitude scale is logarithmic, an increase in 0.1 translates to about a third more energy released. To put that in perspective, the first event had the explosive force of 1.8 trillion kilograms of TNT. Adding the second segment, the resulting earthquake would equal 2.4 trillion kilograms of TNT.